When it comes to flooring in Edmonton, there’s no one quite like Freedom Flooring. We offer a broad selection of quality brand name flooring options, from carpeting, LVP and laminate, to hardwood and tile. Plus, we offer a full range of flooring service including supply, installation and repair. At Freedom Flooring, we’re about more than just quality products though. 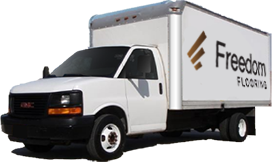 Our mobile flooring truck brings flooring samples directly to you, so you can see in home what your new floor will look like. Compare products, colours and materials, conveniently and in the comfort of your home. We also offer in-home inspections and bring our teams of Edmonton flooring specialists directly to you for accurate quotes and professional advice. Get quality product and expert installations. Let Freedom Flooring provide your next flooring solution.